Adirondack Lifestyle blog quote of the day thus far, from Frances, snowplow artist extraordinaire: "Well, I hope Joann doesn't feel ripped off now." These words muttered early this morning to Ed as he shoveled and Frances plowed. No, the twenty-four inches of heavy snow we just received is just what the ski and eye doctors ordered for Adirondack skiing and eye candy aficionados. The view from home today is one of those mind melters; it changes moment to moment as the clouds blow over and off the sun, highlighting different aspects of the new snow cover. An active sky day calling for an active ski day. As promised, the Adirondack ski and snow report for the Snowicane of 2010 is: it was a good one, but very localized. 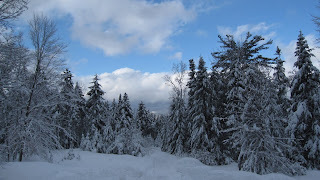 The good news is the 'localized' aspect was elevation, so we received at least 24 inches of new snow here at the homestead, out near Mount Van Hoevenberg, in Lake Placid. But Raybrook, New York, 10 miles away, only received an inch of snow. I will extrapolate that data to mean the High Peaks backcountry received a great deal of snow, at least two feet, and probably a lot more. I am not a meteorologist, by the way, although I may sound like one: the mountains got a lot of snow. Finally, I haven't skied the new snow yet, so, I am sorry to say I have no report. Therefore, purely in the interest of research for this blog and you my readers, I'll be out gathering ski condition data for the remainder of how ever long it takes.